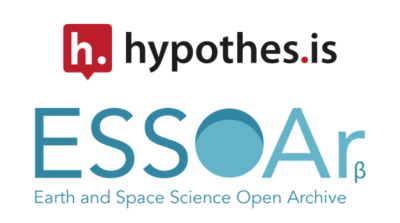 AGU, Atypon, and Hypothesis are today announcing the selection of Hypothesis’ open source annotation framework to provide annotation capabilities on the Earth and Space Science Open Archive (ESSOAr), the open discovery and dissemination service for early research outputs, including preprints and posters presented at major scientific meetings. Launch of the new feature is expected in early 2019. ESSOAr, “a community server established to accelerate the open discovery and dissemination of Earth and space science early research outputs” is a joint initiative between the American Geophysical Union (AGU) and Atypon, with generous support for its initial development from Wiley, AGU’s publishing partner. First launched in February 2018, it provides researchers across the Earth and space sciences with a place to post preprints and posters on a freely accessible platform. The ESSOAr integration of annotation with Hypothesis will take advantage of its new publisher group functionality, enabling ESSOAr to create a branded and moderated layer for conversation and collaboration across posted content. The Earth and Space Science Open Archive (ESSOAr) is a community server established to accelerate the open discovery and dissemination of Earth and space science early research outputs, including preprints and posters presented at major scientific meetings. The AGU and Atypon developed ESSOAr in a joint initiative with generous support from Wiley. An advisory board made up of of leaders and members of a diverse set of leading international Earth, space, and environmental societies guides ESSOAr, and currently includes participation from the AGU, American Geosciences Institute, American Meteorological Society, Association for the Sciences of Limnology and Oceanography, Earth Science Information Partners, European Geosciences Union, Geochemical Society, Geological Society of America, Japan Geoscience Union, Mineralogical Society of America, Seismological Society of America, Society of Exploration Geophysicists, and the Soil Science Society of America. Journalists can find new research in Earth and space science, including manuscripts and conference posters, on ESSOAr. Journalists do not need to register to browse and read material in ESSOAr, but will need to create an account through ORCID to subscribe to email alerts about new content. Please note that ESSOAr is a venue for sharing preliminary communications of new research for feedback prior to peer review. Data may be preliminary. These materials have not been peer-reviewed and could change substantially before final publication. For additional information, please contact ESSOAr at support@essoar.org. Atypon develops publishing technologies for getting mission critical content into the hands of the practitioners and researchers who need it most. Literatum, our online publishing and website development platform, gives content providers easy-to-use and automated tools to manage, market, and monetize every type of content that they distribute, from standards and scholarly articles to online courses and videos. Founded in 1996, Atypon is headquartered in Santa Clara, CA, with over 400 staff in 10 offices in the United States, Europe, and the Mideast.